Material: Premium quality canvas.Made of high density washed cotton canvas and, classical and fashion.Dimensions: 24 cm (W) x 13 cm (H) x 10 cm (D) High quality nylon zipper,long life.excellent craftmanship,Nylon suture,bearing well. 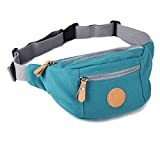 2 MAIN POCKETS – Perfect size hip bag for women, or children and their belongings like cell phone, cash, credit card, and concert tickets.Zipped front and back pocket for on demand storage. Adjustable strap.Closed zipper to prevent things fall out.It is safe to collect your bank card or dollar on it. A great gift choice, it’s fit for outdoor, travel, shopping, beach, Sports, Fashion.It will make your outdoor life more comfortable. This entry was posted in Luggage and tagged Blue01, Canvas, Eshow, Packs, Sports, travel, Waist, Women's by Perfect Vacation. Bookmark the permalink.